And that wraps up this week's serendipitous nature hearts series! I love this--so true, and so individual. Michael Perry so concisely words his keen observations of our shared human condition; I think you'd really like his writing. I read "Truck: A Love Story" a couple years ago - had my husband laughing with a couple out-loud sharings. thank-you for sharing them! enjoyed. 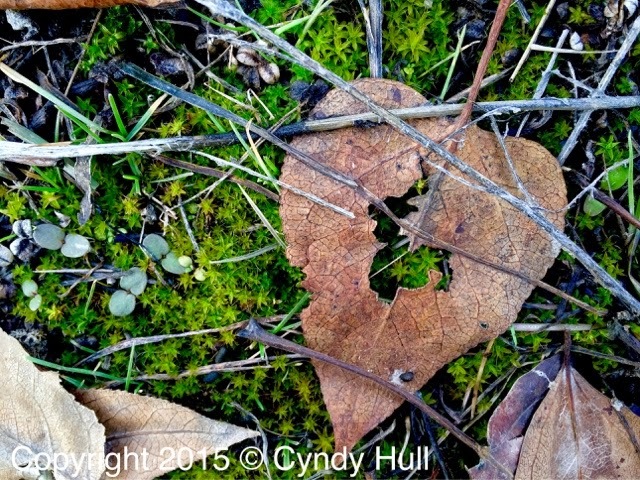 Cyndy - your series is such a love-ly way to remember that love is all around us if we are open. Love how you saw a deeper level! I was a little distracted by the moss silhouette in the leaf - looks like a bouncing rabbit.